Abstract: Petrological, sedimentological and ichnological studies of cores from the Menin-1 borehole revealed episodic shallow marine influence in the terrestrial clastics underlying the Devonian clastic and carbonate rocks. The organic-walled, acid-resistant microfossils have been recovered from bioturbated beds and have allowed us to determine the age as the earliest Cambrian (most likely Platysolenites antiquissimus faunal Zone). Several index acritarch species justify a preliminary assignment to the Asteridium tornatum – Comasphaeridium velvetum acritarch Zone. The microfossils are very well preserved, without any noticeable thermal alteration (thermal alteration index about 1+) or mechanical damage. The ichnoassemblage contains Diplocraterion isp., Skolithos isp., and Planolites isp. The intensity of bioturbation and ichnofabric patterns correspond well to those described from the Cambrian of the East European Platform. The composition of Cambrian acritarch assemblages, of the ichnotaxa, as well the very low thermal alteration of organic-walled microfossils, link this Moravian sedimentary cover of Brunnia (Brunovistulicum in broader sense of the meaning) to the sediments of the same age which rest on other crustal segments in the southern and central part of Poland and even farther on the Baltica Paleocontinent. This indicates a connection rather than separation of these Cambrian "Gondwanan parts" and Baltica by the Trans-European Suture Zone. 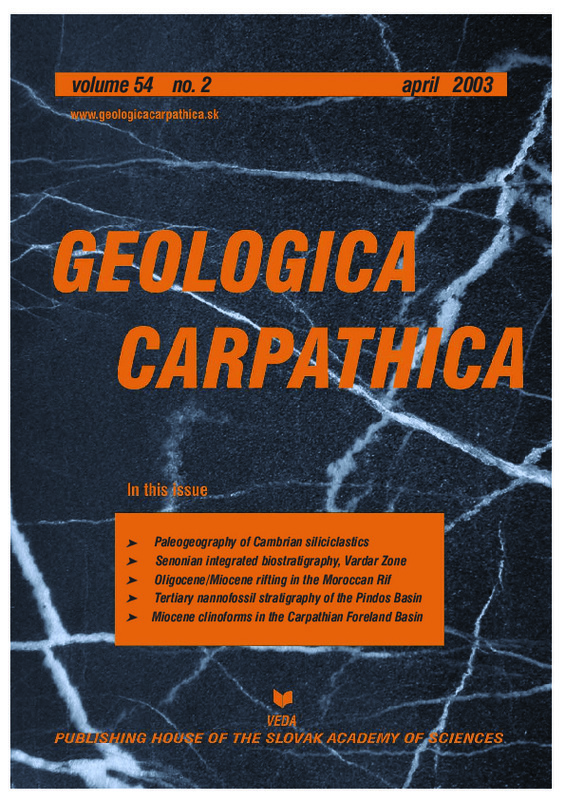 Abstract: A new integrated biostratigraphic concept of an Upper Cretaceous series near Novi Pazar, Stara Raska region, the Vardar Zone, for Bajevica-Mur and Gradina, is based on the distribution of benthic foraminifers, planktonic microfossils, and calcareous nannoplankton, supported by available information on rudists from Bajevica. The Upper Cretaceous succession in the Stara Raska region is characterized by a transgressive trend. The shallow-water sedimentation was short (uppermost Santonian?–Lower Campanian). Progressive deepening during the Campanian Elevata, or the CC17 and CC18 Nannoplankton Zones, is indicated by successive deposition of shallow-water limestones and lower-ramp hemipelagic carbonates, and then of basinal pelagic sediments. Abstract: New sedimentological, petrographic and structural data have been collected from the Oligocene-Miocene terrigenous deposits unconformably overlying the highest tectonic units of the internal Rifian Chain (Ghomaride Units). These new data show (i) the abundance of coarse- grained facies (disorganized and organized conglomerates and pebbly sandstones), (ii) a sedimentary supply from very slightly metamorphic Paleozoic sources and from Mesozoic carbonate cover and (iii) the dominance of a mainly extensional syn-sedimentary tectonic activity. Stratigraphic and petrographic characters point out a palaeogeographical al scenario where the Ghomaride Units, believed to be the sources of the analyzed successions, fed small “satellite basins” located above the fold-thrust belt by means of gravity and debris flow processes. Moreover, the low textural maturity of the analyzed sandstones seems to suggest conditions of short transports linked to a rugged topography and to a very unstable tectonic setting. Structural data acquired, in good agreement with that of literature, confirm the existence of a mainly extensional tectonic activity which lasted from the Late Oligocene up to Middle Burdigalian times during the deposition of the analysed successions. So, within a mainly extensional geodynamic context, a continuous rapid erosion of the highly elevated parts (mainly Ghomaride Units) of the folded thrust belt, progressively uplifted, produced the sedimentary supply. During this Late Oligocene-Lower Miocene rifting stage, some of these “satellite basins” evolved, in the rear of the Rifian fold-thrust belt, to more subsiding areas as \"continental trenchs\" and triggered the opening of the Alboran sea. Abstract: In the Klematia-Paramythia Basin, which belongs to the middle Ionian zone and is part of the Pindos Foreland Basin, submarine fan deposits accumulated from the Middle Eocene to the Middle Miocene. Calcareous nannofossils are used as a tool for dating and correlation of the fan sediments. Calcareous nannofossil assemblages have been studied in four main geological cross-sections, located in the Pindos Foreland Basin. Seven nannofossil biostratigraphic units were detected — two in the Middle and Upper Eocene (NP16, NP17–20), one in the Lower Oligocene (NP21), one in the Upper Oligocene (NP24–25), two in the Lower Miocene (NN1, NN2–3) and one in the Middle Miocene (NN7). The Upper Miocene NN8–12 interval probably occurs in the section A–A’. These age data indicate that the Pindos foredeep, as a result of Pindos thrust activity, began subsiding during the Middle Eocene. The basin was filled by submarine fan deposits until the Middle (Late?) Miocene, when internal thrusting ended sedimentation. Abstract: Upper Badenian-lower Sarmatian (Miocene) strata along the active (southern) margin in the Carpathian Foreland Basin reveal seismic-scale deltaic clinoforms that grew from the south and developed a shelf-to-basin floor relief of over 300 m. Two architectural types and six 4th-order sequences were distinguished along the clinoforms on the basis of correlation of an extensive network of seismic lines and geophysical well logs. A Type A clinoform consists of steeply dipping (3–4°), planar-oblique strata that occur in narrow (2–4 km wide) belts composed chiefly of aggrading thick-bedded massive sandstones with onlap upper terminations. Type B clinoforms occur in wide (8–12 km) belts of less steep (<=2°), strongly tangential strata composed of mouth-bar/prodeltaic increments that lack thick turbidites and show downward-stepping to retrogradational stratal arrangements. Both clinoform types document shelf-margin accretion, chiefly during periods of relative sea-level fall and early rise. None of these types predicts a coeval basin-floor fan development, either because the slope was too narrow to ignite delta-fed hyperpycnal flows into high-efficiency turbidity currents (type A), or the bulk of the sand delivered to the shelf edge was trapped within slope-perched mouth bars shifting 6–10 km around the freshly formed shelf margin (Type B) during relative-sea level oscillations. The lower three sequences (upper Badenian) reveal a strong aggradational component, whereas starting from the angular unconformity at base of the Anomalinoides dividens Zone (lower Sarmatian) the offlap break assumes an increasingly flat trajectory basinwards. This change is thought to reflect a decreased rate of addition of accommodation due to cessation of thrust loading, and faster progradation of the clinoform. It is concluded that large-scale clinoformed shelf margins are not limited to rifted continental shelf margins, but can also be present in foreland basins. In such an environment, flexural and fault-induced subsidence promotes long-term relative sea-level rise in the hangingwall and, consequently, the generation of long and high deltaic clinoforms on the accreting shelf margin, whereas the actively rising footwall precludes the preservation of paralic facies and provides an abundant sediment supply for delta growth.